My family and I have been on Sunday at the Florida State fair. and a lot of attractions like double head princess, half man half mermaid and the smallest pig in the world, they had as a small cracker town. 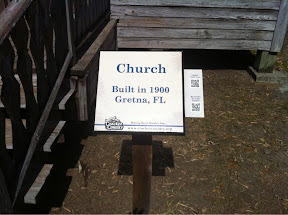 The town had original houses from Florida crackers from the 19th century. What are the Florida crackers? Florida cracker refers to original colonial-era English and American pioneer settlers of what is now the U.S. state of Florida, and their descendants. The first Florida crackers arrived in 1763 when Spain traded Florida to Great Britain. The British divided the territory into East Florida and West Florida, and began to aggressively recruit settlers to the area, offering free land and financial backing for export-oriented businesses. The territory passed back to the Spanish crown in 1783, and then to the US government in 1819. Spanish rule in the late 18th and early 19th centuries was only nominal and the territory was wild and lawless. The town was awesome I felt like going back in time if there has not been something amazing modern. In front of each house was a sign with two QR codes. One code for English and one code for Spanish. The visitor had to scan one of the codes which redirected to a website with an audio file. The audio file was (for each house) about 5 minutes and explained the history of the house. I have to say it worked perfect with my iPhone 4, however some Android users had problems because the phone could not find a program to run the mp3 files. A complete list of the audio files can be found here. It was a perfect use of QR code. I stopped and watched how many people actually tried to scan the codes. I counted in a time period of 20 minutes 250 people going into the church but only 4 people even trying to scan the QR code which two of them had problems to get the audio file to work. At least 20 people were wondering for what and what the QR code is. Giving two more years and much more will do it. The idea is really great. I remember that in the past i had to rent an audio guide to go through a museum, which did cost money and did never work well. Nowadays we can scan a QR code and in some cases even use it in combination with augmented reality not only to hear the explanation but to see some extra layer of info on top of the art. Technology as education, i love it.